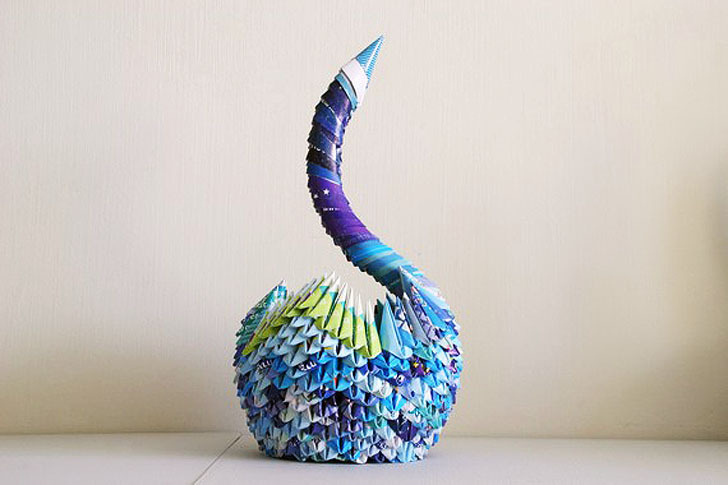 We here at Inhabitat love origami art, especially when an artist is able to lovingly create works made entirely from unexpected recycled materials. Inspired by the idea of reuse, Ruti's Roots' beautiful sculptural forms are an incredible example of how old tea and chewing gum wrappers can undergo a creative transformation to become unique and even useful designs! The Israel-based designer collects and sorts through discarded paper to create these intricate and labor-intensive sculptures, sometimes consisting of over 400 small pieces of hand-folded paper! The designs range from small boxes and pots to elegant swan pencil holders – a perfect and peculiar addition to a cluttered desk. Each original piece is constructed using a durable cardboard base to ensure the structure is a sturdy storage solution or 3-D form. Along with many other artists using origami methods to create fantastic tea sets or stunning lamps, we can’t wait to see what delightful paper designs come next! I am very impressed by the creativity and work that must go on these. Israel based ‘Ruti’s Roots’ collects and sorts through discarded paper to create these intricate, labor-intensive sculptures. An unusual addition to a cluttered desk, but able to get the job done. Some sculptures consist of over 400 small pieces of hand-folded paper. 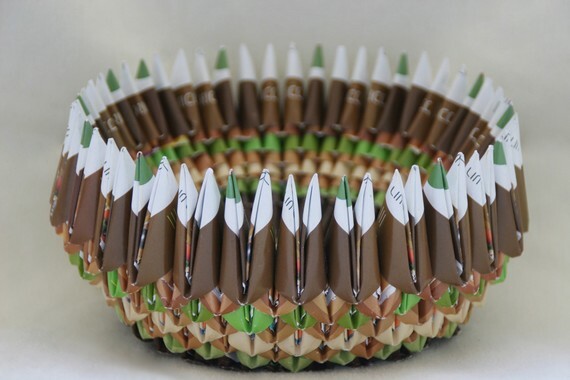 The designs range from small boxes and pots to elegant swan pencil holders. Each unique piece is constructed using a durable cardboard base. The structures are a sturdy storage solution or 3-D decoration. The 26-year old Occupational Therapy student behind the design label has been drawn to “the magic of folding recycled paper and creating various works of art” for the last few years. Hand selected and color-coordinated pieces of paper construct each item. Each original design is carefully thought out. Along with many other artists creating paper art, we can’t wait to see what delightful designs will come next!